1) This is Mother's Day weekend, so please go through the photographs you have of your mother and share one of your favorite photograph of her. Just one. Oh, tell us why it's one of your favorites, and tell us something about your mother, too. This is a two-generation picture of the tow most important females in my childhood. 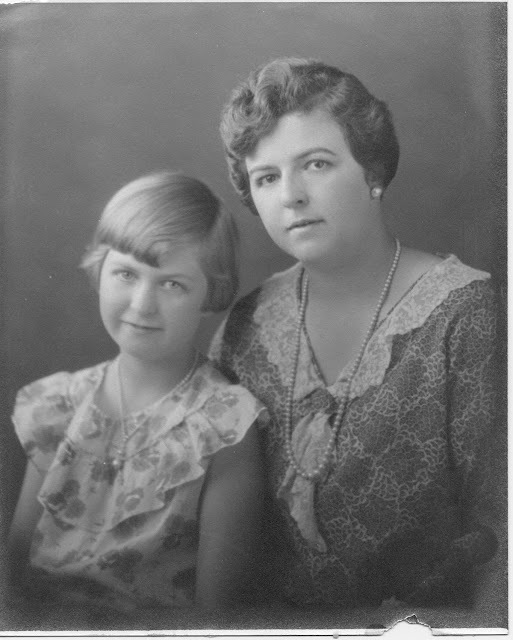 The photo was taken in about 1929, and shows my mother, Betty Virginia Carringer (1919-2002), as a 10-year old girl with her mother, Emily Kemp (Auble) Carringer (1899-1977). My mother was an only child, and the family resided in San Diego on Fern Street. As a 10-year old, my mother had her whole life ahead of her, just like my granddaughters have theirs ahead of them. She excelled in school and had many friends. In the coming years, she would attend San Diego High School, then go on to San Diego State College, receiving a Bachelor of Science degree in Art, and finding work as a junior high school art and English teacher in 1940. She met Frederick W. Seaver in 1941, and they were married in July 1942. They lived in Chula Vista, and both worked at Rohr Aircraft in the early years of World War II. Pretty soon, their eldest son Randy was born, Fred went into the Navy, and soon after he returned in early 1946 another son, Stanley, was born. They moved to 2119 30th Street, and lived there until 1978. The third son, Scott, was born in 1955. The boys attended Brooklyn Elementary School, and she worked in the PTA for many years. She also became a Little League mom, in addition to being chief cook, nurse, laundress, seamstress, shopper, and the greatest mother. Always a calming influence in a family with four boisterous males, she spent her free time doing art projects, reading books, watching TV, and helping her elderly parents. She was the quintessential 1950's mom. Life happens - and we don't know what's in store for us. My mother succeeded in raising three sons, having a happy home life, and serving her family and colleagues well. This is one of my favorite photographs of my mother because it shows her as an innocent child with her own mother. Please tell me about your special mother and show us a picture! I am in the 8th great-grandmothers and I'm up to Ancestor #1417, who is Sarah BRIGGS (1637-1689) [Note: the earlier great-grandmothers and 8th great-grandfathers have been covered in earlier posts]. 1416. Stephen Wing, born about 1621 in Vlissingen, Zeeland, Netherlands; died 24 April 1710 in Sandwich, Barnstable, Massachusetts, United States. He was the son of 2832. John Wing and 2833. Deborah Bachiler. He married 07 January 1655 in Sandwich, Barnstable, Massachusetts, United States. 1417. Sarah Briggs, born about 1637 in probably England; died 26 March 1689 in Sandwich, Barnstable, Massachusetts, United States. * Sarah Wing (1659-1720), married 1680 Robert Gifford (1660-1730). * John Wing (1661-1728), married (1) 1685 Mary Perry (1659-1714); (2) 1693 Miriam Deane (1632-1703); (3) 1715 Mary Bannister (1660-1720). * Elisha Wing (1669-1757), married 1689 Mehitable Butler (1670-1731). * Matthew Wing (1674-1724), married 1694 Elizabeth Mott (1659-1723). 2834. John Briggs, born about 1610 in England; died before 01 June 1641 in Sandwich, Barnstable, Massachusetts, United States. He married before 1638 in probably Massachusetts, United States. 2835. Katherine, born about 1615 in England. * Sarah Briggs (1637-1689), married 1655 Stephen Wing (1621-1710). * Samuel Briggs (1640-1714), married 1664 Elizabeth Ellis (1643-1681). * Edna Anne Hannibal and Claude W. Barlow, John Briggs of Sandwich, Massachusetts and His Descendants (Palo Alto, Calif. : Hannibal, 1962). In this series of posts, I am discussing the challenges that I found with the heirs of Elizabeth Auble named in her 1893 will. In Post 4, I noted that I had found a newspaper article that described the death of William Auble in 1844 in Philadelphia, Pennsylvania. That article was from a Sussex County, New Jersey published in the 1890s, highlighting articles for the same date in 1844. I thought it was strange that I couldn't find articles from 1844 from Philadelphia when GenealogyBank has several newspapers from that time frame. When I searched for William Auble and specified Philadelphia and 1844, I received no matches. So I searched for last name of Auble, plus Philadelphia and 1844, and there were 69 matches. Many were for this unfortunate incident - but the victim was a Samuel Auble! ble ran across the road, saying, "I'm wounded." committed for a further hearing on Friday next." in the hands of William Ryninger." tion of the Fire Department." Based on these articles, including a criminal court verdict, it is apparent that the victim was Samuel H. Auble, aged 21, who died on or about 12 September 1844 in Philadelphia, Pennsylvania, after being attacked on the street. The question I have now is: Was this Samuel H. Auble a brother of my second great-grandfather, David Auble, as noted in the New Jersey newspaper article? The New Jersey newspaper got the name wrong, but did they get the relationship right? I don't know and have found no other records of the existence of this Samuel H. Auble. Finding these records, and solving this challenge, removes the evidence conflict I had on William Auble - how could he have died in 1844 and have had a son born in 1848 named as a nephew in Elizabeth Auble's will in 1893. There is a lesson learned here - Expand your search in records when you cannot find what you expect to find. In this case, I searched with the wrong given name, then succeeded with no given name.